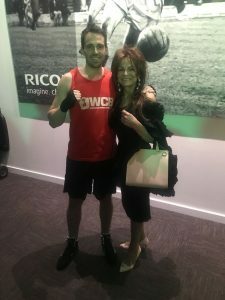 A CARDIFF recruitment consultant who climbed into the ring to trade punches in a charity boxing match has proven he’s no lightweight after raising almost £3,000 for Cancer Research UK. Dad of one Josh Williams, who had never boxed before, beat his opponent in front of a packed audience at Cardiff City Stadium on Saturday night. Josh, 34, from Marshfield, was inspired to take part in the Ultra White Collar Boxing event as his mother in law, Nikki Ramsey, is battling stage four ovarian cancer. Josh said: “I wanted to take part to raise funds for research and to increase awareness of ovarian cancer. Nikki, 64, had been experiencing lower abdominal pain, heartburn and change in bowel habits since December 2016. Launched in 2009, UWCB was created to give people with no boxing experience the opportunity to train with a professional boxing coach and then take part in a safe but competitive three round bout. Each participant receives eight weeks free training at a local partner gym with professional coaches, in a safe and enjoyable environment. At the end of the training they are matched with an opponent from their group to take part in a competitive bout at a special black tie event in front of their family, friends and supporters. Not only are participants helping to beat cancer, but many are changing their own lives at the same time. Losing weight and making changes to live a new healthy lifestyle long after they complete UWCB, in turn reducing their own risk of developing the disease. The fundraising phenomenon has raised up to £56,000 a day for the charity, which then goes towards funding research into kinder treatments and a cure for the deadly disease. Cancer Research UK is the world’s leading cancer charity dedicated to saving lives through research. It receives no government funding and every step it makes towards beating cancer relies on every pound donated by people like the UWCB participants.